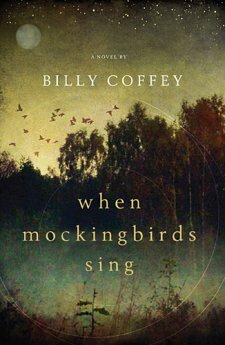 Supernatural, symbolic, engrossing, unique, When Mockingbirds Sing by Billy Coffey is a poignant and challenging story. When Mockingbirds Sing by Billy Coffey takes us into the lives of a little girl, Leah Norcross, and her parents. Leah suffers from a stutter when she speaks and has an imaginary friend she calls Rainbow Man. She shares her visions with her best friend Allie and has faith that everything the Rainbow Man tells her is going to come to pass. After Leah receives an easel from the shopkeeper, Barney, she paints what the Rainbow man directs her to paint. Barney thinks good fortune has come his way because of the painting. This book demonstrates faith and belief, and it shows that God often speaks in mysterious ways. When Leah’s painting becomes known, the town reacts negatively, and much controversy results. The mockingbirds become a nuisance in the town, the people protest the noise, but more is going on than they realize. When God speaks through the imagination of this child, miraculous things result. This ordinary town experiences extraordinary things. The characters in When Mockingbirds Sing are well-developed and "real." Billy Coffey’s writing style is captivating and lyrical. Small town life, struggles, faith, doubt, friendship, belonging, childlike innocence -- all of these combine to create a magical story. I would recommend this book to any of my friends.